FSC-certified heavy timber structure reduces carbon footprint and adds to beauty of the building interiors. Forest Stewardship Council Certified timber framing supports the building above a concrete base. All wood from within 1000 km, all steel and concrete from within 500 km. 545 metric tons of CO2 are sequestered in the wood. The bones of the Bullitt Center are comprised of three principal materials: wood, concrete, and steel. These materials are carefully used according to their specific load-bearing characteristics and great care was taken to reduce carbon emissions during construction of the Bullitt Center. Concrete is one of the most notorious carbon emitters in the construction industry. There is an incredible amount of energy embedded in the creation of concrete, but it is also valued for its flexibility, affordability, and capacity to handle enormous amounts of compression. So the design team limited the use of concrete to the bottom of the building, where it is most needed to carry the loads of the building, hold back the earth, and retain water in the rainwater cistern. The concrete used does not have admixtures typically used to increase the workability of the mix because they are considered a red list material for their impact on the installers’ health. Above the second floor, the Bullitt Center is constructed with heavy timber framing, recalling Seattle’s history of heavy timber warehouses. 100 percent of the wood used is Forest Stewardship Council (FSC) certified, ensuring it came from a responsibly managed forest. For the structural timbers, the project relied on glued-laminated timbers (also known as glu-lams) made by Calvert Glulams in Vancouver, WA. Each 6” x 14” beam and 10” x 10” column is comprised of smaller planks sourced from FSC certified forests, which are glued together to make what is called a glu-lam, Glu-lam beams and columns use wood efficiently, since they are engineered and cut off site, ensuring materials are efficiently used. In addition, they do not require large dimension timbers and eliminate weak points caused by deformations in the tree. 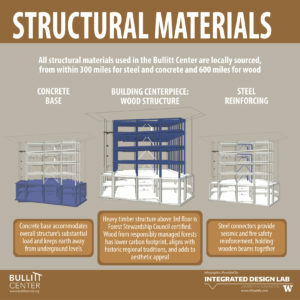 Using wood sequesters carbon for the life of the building, with 545 metric tons of carbon locked away in the Bullitt Center for the next 250 years. Wood functions well for vertical loading, and is quite ductile in the case of earthquakes. Steel is still an optimum material for carrying horizontal loads in the case of high wind or earthquakes. A steel core with cross-tension members helps the Bullitt Center bring horizontal loading to the ground.